Just weeks before its official unveiling, Samsung’s Galaxy S9 has appeared on the benchmarking site Geekbench. For the last several years, the Korean company has launched two versions of its flagship smartphones – one with Qualcomm’s Snapdragon chip that is sold in the US and China, and a second version with Samsung’s own Exynos SoC that is sold in all other markets. Other than different processors, the devices tend to have the same technical specifications in all regions. Since the US and international versions feature different processors, there is almost always some performance difference. The Exynos variant has traditionally outperformed the Snapdragon models in speed and energy-efficiency, though the Snapdragon versions have been better in graphical performance. Twitter tipster Ice Universe has posted a screenshot of the Galaxy S9’s benchmark results. Ice Universe has accurately leaked details of unreleased smartphones in the past. According to the leaked screenshot, the phone that appeared on Geekbench had 6GB RAM. Past reports have suggested that 6GB RAM would be offered only on the larger Galaxy S9 Plus, with the regular S9 featuring 4GB RAM. Ice Universe says the Galaxy S9 Plus running Snapdragon 845 SoC delivered “mediocre” results. The benchmark results are not earth-shattering, but they are certainly not “mediocre.” Ice Universe expects the Exynos 9810 version of the Galaxy S9 and S9 Plus to deliver even better results. The Galaxy S9 Plus running Snapdragon 845 scored 2378 points in single-core and 8132 points in multi-core tests. These are only marginal improvements from last year’s Galaxy S8, which had scored 1954 points in single-core and 6429 points in multi-core tests. 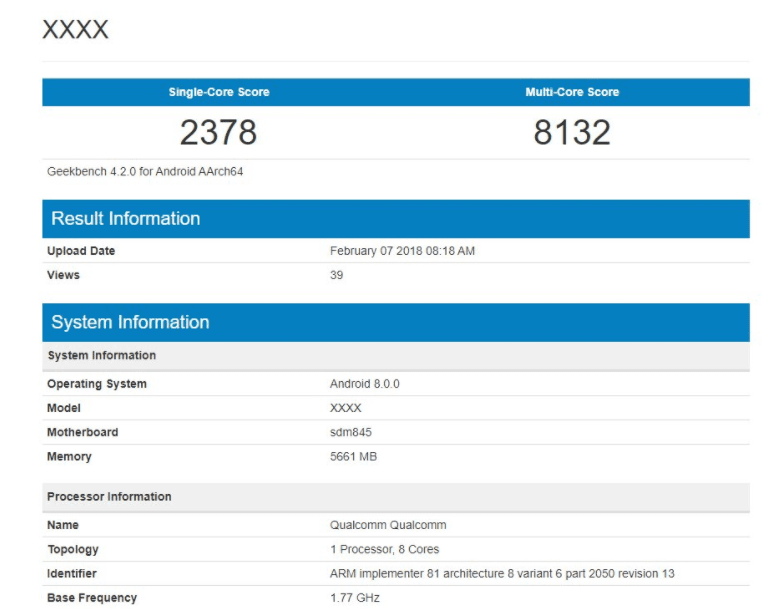 By comparison, Apple’s iPhone X running A11 Bionic chipset has scored 4197 in single-core and 10,051 points in multi-core tests. The results suggest that the iPhone X will remain the most powerful smartphone for quite some time, unless the Exynos 9810 variant of Galaxy S9 springs a huge surprise. Benchmark results do not always accurately reflect a phone’s real-world performance, which depending on a variety of factors including software optimization. Anyway, even if the Snapdragon-powered Galaxy S9’s performance is lower than iPhone X, you’ll not notice any performance lag in real-life usage. Samsung will also improve the cameras on the Galaxy S9 and S9 Plus. The regular S9 is said to have a 12MP sensor on the back with a variable aperture of f/1.5 to f/2.4. The larger Galaxy S9 Plus would feature a dual camera setup (both 12MP sensors) on the back. Both the handsets will have an improved Camera app, according to the rumor mill. Sources familiar with the matter have told SamMobile that the Galaxy S9 and S9 Plus would offer a ‘super slo-mo’ feature that will allow you to capture videos at 1,000 frames per second. The feature will reportedly have at least two different modes. The standard mode will allow you to tap on the shutter icon to start recording and tap again to stop. The second, automated slo-mo mode, will let you tap the record icon to get started. But the device will start capturing slo-mo videos only when it detects movements. Reliable tipster Evan Blass has shared pictures of the DeX Pad dock that is expected to launch with the Galaxy S9 and S9 Plus on February 25th. The DeX turns your Galaxy phone into a desktop by connecting it to a keyboard, monitor, and mouse. Samsung seems to have changed the dock’s design so that the DeX Pad could hold the smartphone flat instead of standing it up. The flat design could allow users to use the Galaxy S9’s screen as a touch pad. The DeX Pad has two USB Type-A ports, a USB-C port, and an HDMI output for display. The rumor mill claims the DeX Pad will be backward-compatible with last year’s Galaxy S8 as well. The pictures shared by Evan Blass show that the Galaxy S9 and S9 Plus would retain the 3.5mm headphone jack. Even though Apple and Google have done away with the audio jack on their flagship devices, Samsung is reluctant to ditch the feature because consumers still love it. The photos also show the Bixby button placed below the volume rockers on the side. Though Bixby wasn’t received well on the Galaxy S8, Samsung remains committed to its in-house AI assistant. Yes, the Galaxy S9 will have Google Assistant as well as Bixby Assistant. Samsung will likely start taking pre-orders for the upcoming flagships on March 1st, and launch them on March 16th. If you are planning to buy the Galaxy S9 or S9 Plus, you have to start saving up money right now. According to ETNews, the regular Galaxy S9 would cost between $875 and $925, which would make it far more expensive than the $720 Galaxy S8. The larger S9 Plus could set you back by close to $1,000, if not more.